I’m happy to report that things are progressing well, over all, at the Gingerbread Dollhouse, even though we haven’t been up there in a couple of weeks (first missed weekend was spent at a convention, then the next one we just needed a quiet weekend at home to recover from the previous one!). Of course, when weÂ were last there, we (and by we, I once again mean Todd) went for another round with the hot water heater (which I realize is rather redundant, and yet I seem to always default to that instead of just water heater–I’ll work on it). Look out, y’all! I found the speed controls and some background music; before you know it I’ll almost look like I know what I’m doing! But seriously, I’m making an effort to keep the videos rather short and single-topic, so this is the first part of “weekend 4” and there’s at least 1 more part to add to our Gingerbread Diaries Playlist on YouTube, so make sure you subscribe to not miss anything (not all of them will be embedded in posts). While Todd was working on the water heater, I was taking care of another small chore that I’d been meaning to do since we bought the house: smudging. You might think I’m a bit off, or maybe you agree with me, but with new spaces (and old houses especially), you just never know what kind of energy has been left behind. Between the 100+ years the house has stood and in light of the last 10 years or so spent as a personal care home, there’s bound to be some negative vibes hanging around that we could just do without. I actually don’t mind if the house is haunted–it might add some character, you never know–but I’d like only happy haunts if you don’t mind. To that end, I went room by room, window by window, and door by door, with a smoking bundle of sage and sweetgrass to help cleanse the area. If nothing else, it felt like a productive thing and gave me a bit more peace of mind when I went to sleep that night. In fact, it might have been the first night I slept easily and soundly in that house! He wasn’t our only visitor this weekend, either! One of Todd’s former coworkers knocked on the door to take a peek inside the place and we were happy to show her around (despite the construction clutter). We haven’t even moved in yet and we’ve had more people stop by and say hello from the neighborhood than we have in the 3.5 years we’ve lived in our current home! Once again, Thomasville shows itself to be a true southern town. 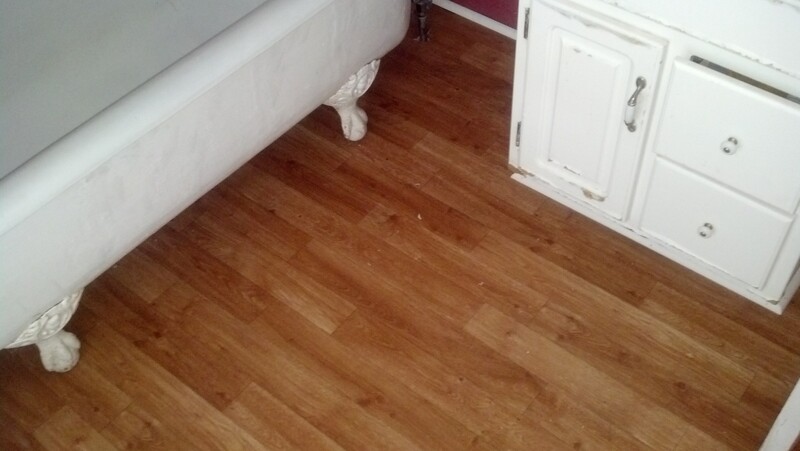 The new flooring in the upstairs bath. Since that visit Todd’s been kind enough to drop by the house and take pictures of the progress so I don’t feel so out of the loop! In the last 2 weeks they’ve replaced the vinyl flooring that was in horrible shape with a rather nifty sheeting that looks like wood planks. Since I’d told them to find the cheapest replacement out there I was expecting plain white or brown flooring so this is an unexpected treat. We’ll be replacing it all as we do the room-by-room renovations (hence the request for cheap and serviceable) over the years but this’ll hold us better than expected while we decide what to do next. 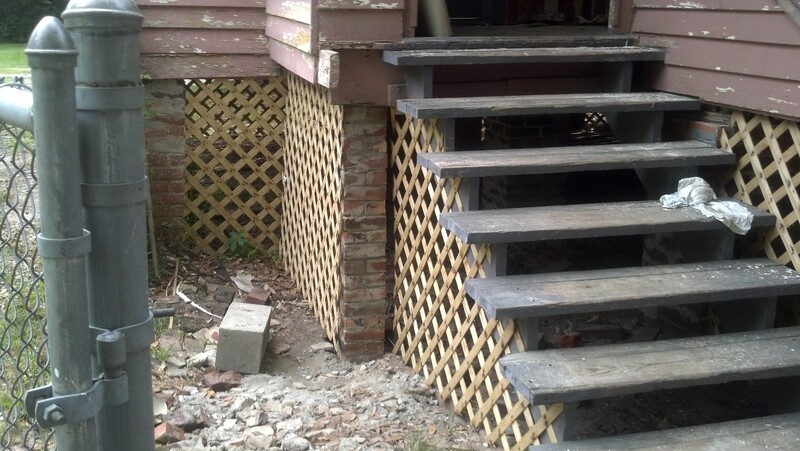 They’ve repaired the brick pillars at the back (the culprits for our “structural” issues) and installed lattice skirting to enclose the crawlspace. 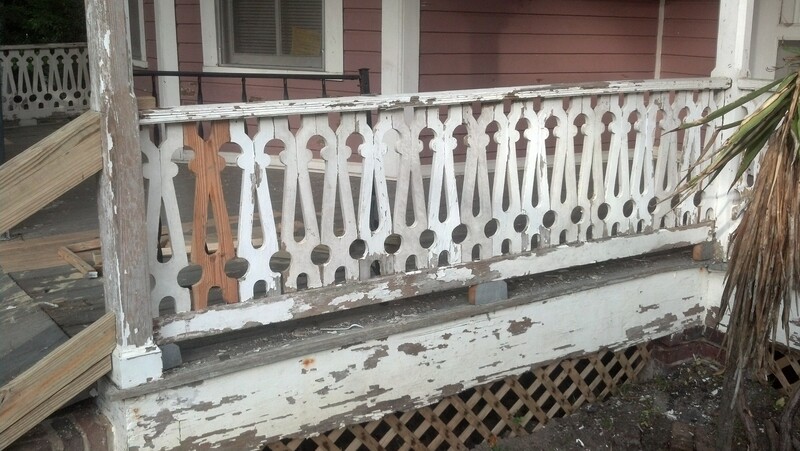 There were almost enough recovered cut-work spindles to reassemble the railing on the side of the porch, looks like they only had to cut 1 new one. 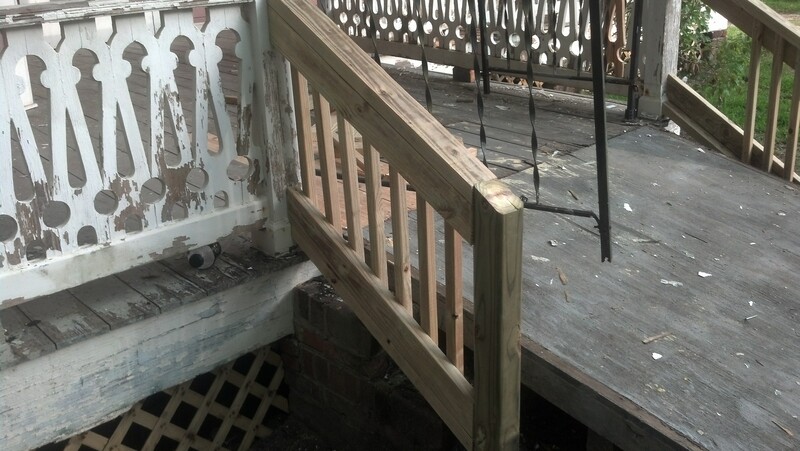 And they’ve even built us new railings on the ramp/stairs (the ramp is staying until we get moved-in, we figured it might make things easier for moving furniture). Aside from a few odds and ends inside, the last big push is to get the exterior scraped and then the big finish: painting!